Tamra von Schroeck, CPA, is Dignity Health’s senior director of operations and finance for philanthropy and is responsible for the system-wide operational and financialmatters of Dignity Health’s 29 affiliated fundraising foundations which raise philanthropic dollars Dignity Health. She leads philanthropy operational and finance initiatives, develops standard operational and financial policies and procedures, provides leadership in best practice sharing, and contributes to the development and oversight of Dignity Health Philanthropy’s strategic goals. 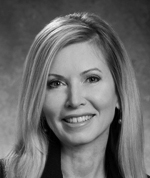 Prior to joining Dignity Health in 1995, Tamra was a senior auditor and senior tax Consultant for Deloitte (formerly Touche Ross), an international public accounting firm, where she developed an industry specialization in non-profit organizations. She holds a bachelor of science degree in accounting from the University of South Dakota.